The water park is positioned at the heart of SHARE’S bay, promising hours of fun! The water park is to be open on weekends from Easter and daily throughout July & August. The park will be used by both members of the public and groups that visit SHARE. 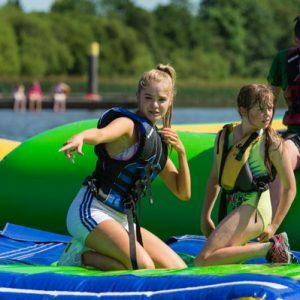 Water Park users will need to be able to swim out to the water park in a buoyancy aid, this proves their water confidence in preparation for their session. Minimum age to go on the water park is 6 years old, all under 10’s must be supervised by an adult with the ratio 1 adult to 2 children. Scheduled sessions for the water park will be running throughout the day and must be pre booked. A one hour session on the water park costs only £10, the 1 hour is inclusive of changing time and time to swim out to the park. The price includes hire of a wetsuit and buoyancy aid. A maximum of 20 participants will be allowed on each session. Remember participants must arrive 15 minutes before their session time! 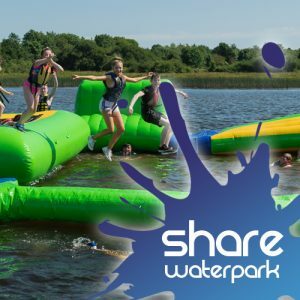 The Water Park can be exclusively booked for a 1 hour session for only £180, maximum 20 people! 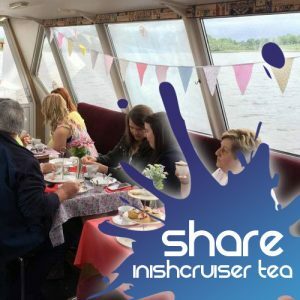 A great idea for a birthday party, group of friends, work colleagues, family get together! 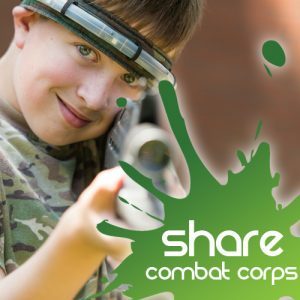 Remember over the summer months SHARE is also hosting a daily activity programme for the public offering 1 & 2 hour activity sessions. 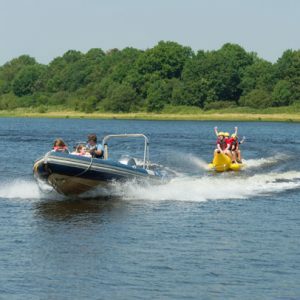 Enjoy the adrenaline rush of being towed at high speed behind a speedboat aboard an inflatable banana! 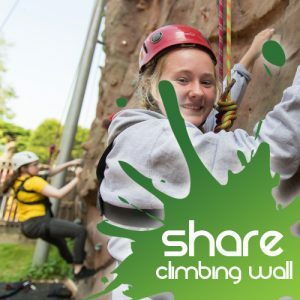 One of our most popular activities – the guarantee of getting wet makes this a big favourite amongst 10-16 year olds. Session Length: 1 hour sessions on Fridays, Sundays, Wednesday and Thursday at 10am and 11:30am, and Saturdays and Tuesdays at 2pm and 3:30pm. Cost: £10 per 1 hour session when booked in advance. 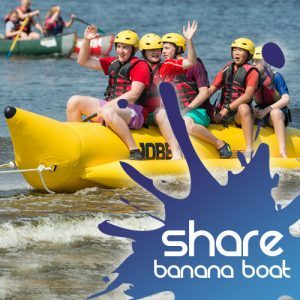 BANANA BOATING IS A PART OF OUR ACTIVITIES FOR ALL! 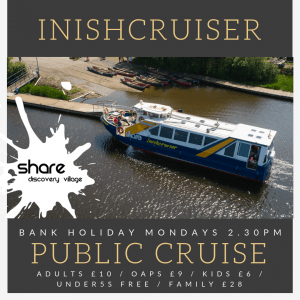 These activities are available to the general public over Easter, weekends in May and June and EVERYDAY in July and August! 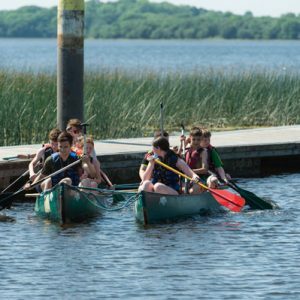 Canoeing is a fun group activity where you can learn new skills and get soaked if you want to! Our Instructors are well able to ensure everybody can get something educational and fun out of a canoe session no matter the ability or age. Rafted Canoes can be used for the less water confident and single canoes used for the more adventurous. Session Length: 1 hour session on Tuesdays and Thursdays at 10am and 11:30am, and Fridays and Sundays at 2pm and 3:30pm. CANOEING IS A PART OF OUR ACTIVITIES FOR ALL! These activities are available to the general public over Easter, weekends in May and June and EVERYDAY in July and August! BCU and UKCC canoe courses are available and run by experienced qualified coaches. These are subject to demand, keep an eye on our What’s On page for upcoming courses or contact Elaine to register interest at elaine@sharevillage.org. 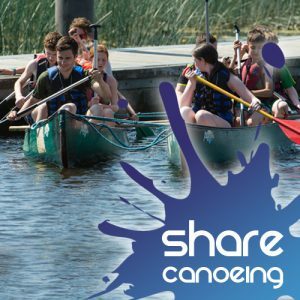 For people aged 10-16 aiming to progress at canoeing can join our range of Summer Schemes which run throughout July and August. 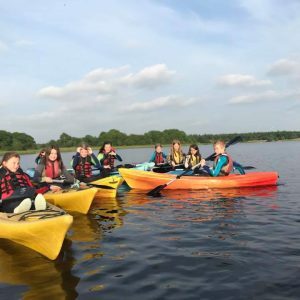 Canoe and Kayak Hire is available all year round and guided canoe trips of scenic Upper Lough Erne can be arranged on request. Why not spend a night in our newly refurbished Trannish Island Bothy. 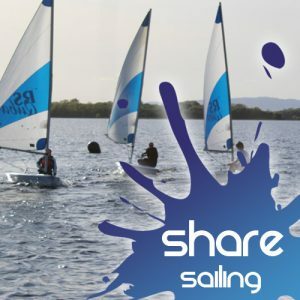 At SHARE we offer both Dinghy and Keelboat Sailing. Enjoy the excitement of controlling your own dinghy or take the controls in a stable Keelboat under the watchful eye of one of our qualified instructors. Choose from a taster session to an RYA recognised course. SAILING IS A PART OF OUR ACTIVITIES FOR ALL! 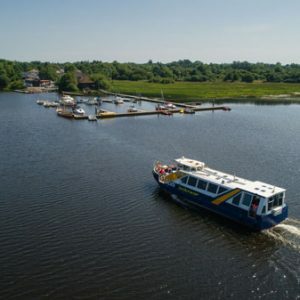 These activities are available to the general public over Easter, weekends in May and June and EVERYDAY in July and August! SHARE’s fleet of RS Fevas, Visions and Qubas means there is a boat to suit all abilities. 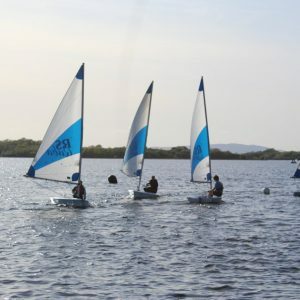 RYA Dinghy Courses include RYA Youth Sailing Scheme Stages 1-4 (suitable for Under 16’s) and RYA National Sailing Scheme Levels 1 – Start Racing (suitable for adults). Keelboats provide a more stable platform to learn how to sail. Enjoy the company of 6-8 friends working together to reach your destination. SHARE provides Keelboat Sailing sessions using Hawk 20s and traditional Drascum Gigs. For people aged 10-16 aiming to progress at Sailing can join our range of Summer Schemes which run throughout July and August. RYA Dinghy Sailing Instructor and Dinghy Assistant Instructor Courses are also available. These are subject to demand, keep an eye on our What’s On page for upcoming courses or contact Elaine to register interest at elaine@sharevillage.org. 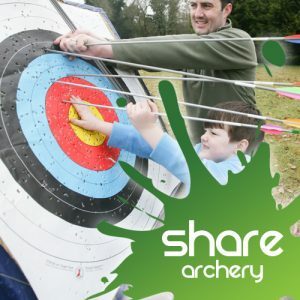 Choose from a taster session involving a short journey and plenty of fun games or a BCU recognised course. 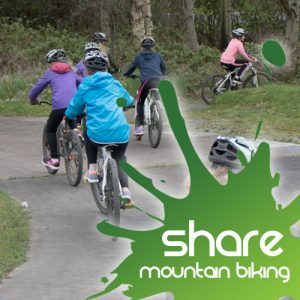 SHARE can provide closed cockpit, sit on top, touring and whitewater kayaks providing you with a varied introduction to the world of kayaking. 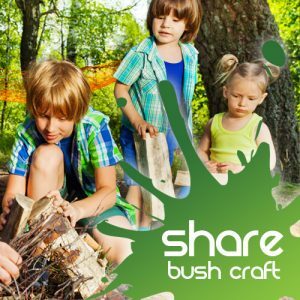 This activity is suitable for all ages and abilities. KAYAKING IS A PART OF OUR ACTIVITIES FOR ALL! These activities are available to the general public over Easter, weekends in May and June and EVERYDAY in July and August! BCU and UKCC Kayak courses are available and run by experienced qualified coaches. These are subject to demand, keep an eye on our What’s On page for upcoming courses or contact Elaine to register interest at elaine@sharevillage.org. 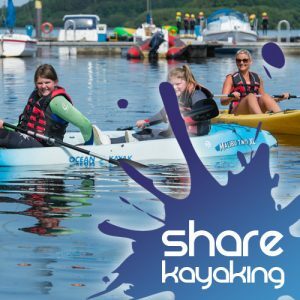 For people aged 10-16 aiming to progress at Kayaking can join our range of Summer Schemes which run throughout July and August.